Are relations with Pakistan a bigger issue for the United States than fighting international terrorism? On May 6, a bill was presented in the U.S. House on stopping all aid to Pakistan until the Americans get a full understanding of what Pakistan knew about Osama bin Laden's whereabouts. This seems a key point amidst the current confusion over the details of bin Laden's destruction in Abbottabad. One might assume that the confusion largely stems from the Republicans' desire to present President Barack Obama as unable to give his people a clear explanation of what happened. Why, for example, do they not want to publish photos of the killed terrorist? Why was there all that talk of an exchange of fire, when it subsequently became clear there was nothing of the sort, he was simply shot dead? Did he try to use his wife as a human shield or not? But, give the whole business a little more thought, and the focus shifts from the White House's statements being clumsy or uninformative to one simple fact: it happened in Pakistan, and it's full of controversy. The new bill requires the Congress to investigate the situation and cross all the t's before Pakistan is given any more American money. However, an investigation might reveal that relations with Pakistan are a bigger issue for the United States than fighting international terrorism. Writers are better than other people at chaining words together: it's in their nature. One author - acclaimed Indian-born novelist Salman Rushdie, who now lives in the United States and previously has lived in Pakistan and can therefore be considered a local expert - posted a very strong essay online. It was concise yet precise in demanding some crucial answers from Pakistan in the wake of the U.S. raid on bin Laden's mansion. "Osama bin Laden, the world's most wanted man, was found living at the end of a dirt road 800 yards from the Abbottabad military academy, Pakistan's equivalent of West Point or Sandhurst, in a military cantonment where soldiers are on every street corner, just about 80 miles from the Pakistani capital Islamabad," he wrote. 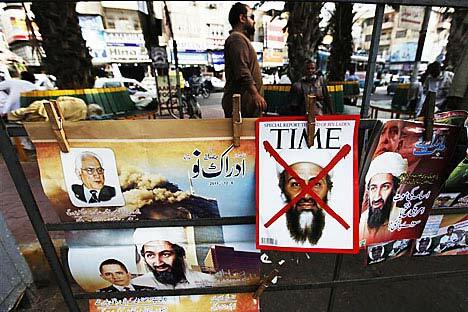 It is worth recalling the whole story of the global phenomenon that was Osama bin Laden. He may be from Saudi Arabia, originally, but the war he waged against the Soviet Union in Afghanistan could never have been successful if he had not been on such friendly terms with U.S. and Pakistani security services. In fact the Taliban, which ruled Afghanistan in 2001, was also the spawn of the Pakistani security services. Now that the public is probing the strange circumstances of the U.S. raid on bin Laden, concern is growing as to whether they were operating on their own or whether they were assisted by the local authorities. Or is there a third option? There seems to be. Perhaps some select individuals in Pakistan knew what was going on. Some - but not all. Take the U.S. helicopter which allegedly crashed during the operation due to an engine malfunction. The White House categorically denies any accidental breakdown. Could this mean that some Pakistani military officials were not quite aware of what was afoot? The whole affair has escalated into a full blown political crisis in Pakistan. Take the money issue: Pakistan receives up to $1.5 billion annually from the United States towards its antiterrorist policies. Overall, U.S. aid to that country tops $8 billion annually, and the general view is that the local economy will inevitably collapse without that support. Furthermore, Pakistan has been a U.S. ally since 2001 when the U.S. got involved in Afghanistan - fighting (lest we forget) the Taliban, Pakistan's erstwhile friends, who gave sanctuary to bin Laden, after he masterminded the 9-11 attack on the World Trade Center in New York. Admittedly, Pakistan did not really have much choice back then, when the U.S. threatened to bomb it "back to the stone age" unless it joined the fight against al Qaeda. But this does not mean everyone in Pakistan is happy with this choice. The elimination of bin Laden has shown everyone discontented with the current regime that their government is either an American puppet, or is simply ignorant of U.S. security services' activity in their country (not to mention the fact that its army base was right next door to a terrorist hideout). When forced to choose between the two evils - incompetence or treason - in this case Pakistan obviously preferred the first. Pakistani officials claim ignorance of both bin Laden's whereabouts and the planned U.S. raid. There is more to it; America does not accuse the whole of Pakistan of giving sanctuary to the world's number one terrorist. They specifically condemn Pakistan's army and the Inter-Services Intelligence. This latter is also believed to have created al Qaeda (for use during the war in Afghanistan, that is) and the Taliban. This militarized intelligence establishment is dubbed a state within a state, and viewed as the only force that keeps the country relatively stable. Many in Pakistan are so angered by the U.S. drones that regularly bomb the country, invariably killing innocent victims. And now this - a U.S. raid kills bin Laden in unclear circumstances, and U.S. financial aid is suspended. What will happen to Pakistan? Who can tell? Salman Rushdie, who obviously has a grudge against his former second homeland, has called for Pakistan to be declared "a terrorist state" and to "expel it from the comity of nations." Suppose the United States heeds his calls. It might turn out that Pakistan's problems after bin Laden's killing were nothing compared to the nightmare America in which finds itself immersed. To begin with, Pakistan, with its massive population of 169 million (making it the world's sixth largest) is a nuclear power. It is nothing like Libya, it is greater and much more threatening. It is also a country that America is still using as base for its ongoing Afghan campaign. Therefore, say Washington speeds ahead with its Afghan "drawdown" and cuts financial aid to Pakistan as well. That would leave it with no tools left to influence Afghanistan and Pakistan - a huge territory packed with terrorists. Then there is India - which has spent years trying to get through to the United States and explain exactly who is sending terrorists out to attack Indian cities and exactly which state contributed, albeit indirectly, to the destruction of the World Trade Center in New York. So if there is a break in United States-Pakistan relations, India will see to it that any new understanding will cost Washington dear. And there is more; but I should probably stop here. With a whole range of potential worst-case scenarios imaginable, the only hope is that they will not all come true at once.